Performing a marketing analysis effectively is essential for evaluating the profitability of business ventures and to determine how conducive the environment may be for a business venture. The Pest Analysis is an important model that can be used as a scale to measure such factors to determine the course of action for a business. What is a PEST or PESTEL Analysis? The PEST analysis includes taking into account the political, economic and social factors, along with a technological analysis to determine the market outlook, to forge plans to steer the business in a specific direction. The PEST analysis in some cases is expanded with two additional factors, namely; legal and environmental aspects. Hence, the name PESTEL or PESTLE is used for such an analysis. Recent additions to this model have also included factors like Ethics and demographic elements (STEEPLE and STEEPLED), however, for the purpose of this post, we will stick to PEST and PESTLE analysis. Political: Political aspects of the analysis include evaluating government control, taxation policy, trade barriers, labor laws and the sphere of the government’s influence in affecting the markets. Knowing such details are essential to ensure that a business is able to freely function within a market without the government negatively impacting profits and revenue. For example, selling a product that is highly subsidized by the government will not be profitable as the subsidy will undercut the price, making the venture unprofitable for private businesses. Social: This is another important consideration for a business. Certain types of products are either legally barred from production in certain countries or may be socially unacceptable for consumption by the vast majority of the populace. Furthermore, businesses can always make good use of social norms and values by ensuring that their marketing strategy not only respects them but also appeals to the socially acceptable standards of people to effectively sell a product. Technological: This may include the availability of technology in a country, the rate to which technology is being adapted or changed in a specific market, Research and Development initiatives and the scope of production costs which may be associated with technology. Environmental: Apart of PESTEL, the environmental analysis includes analysis of ecological and environmental factors like the impact of climate on tourism, insurance, farming, etc. Legal: This also falls under the PESTEL realm and entails the evaluation of health, consumer, antitrust, employment and other types of laws in the country. If you are looking for a head start, you might find it worth using a readymade PowerPoint Template. 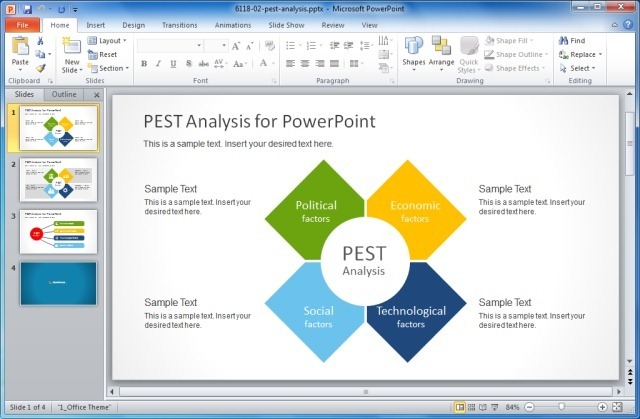 Below are some recommended templates that can help you create a PEST or PESTEL analysis for presentations and official use. 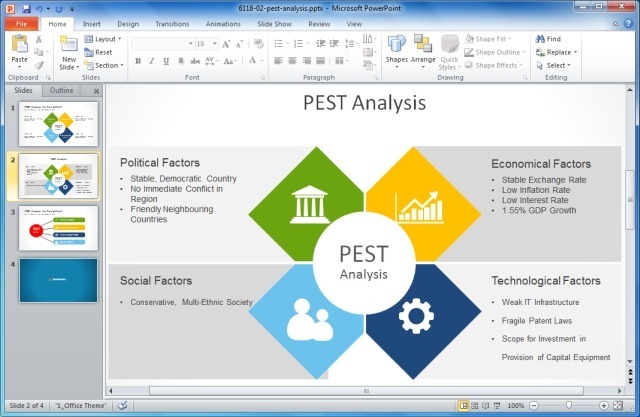 Whether you are looking to create a single slide with a PEST Analysis diagram or wish to show each aspect of your analysis with specific detail, this template can help you create a range of slides with both a summary of your analysis, as well as standalone slides to touch upon political, economic, social and technological aspects of your analysis. As the name suggests, this is a template for creating a diagram of your PEST Analysis. 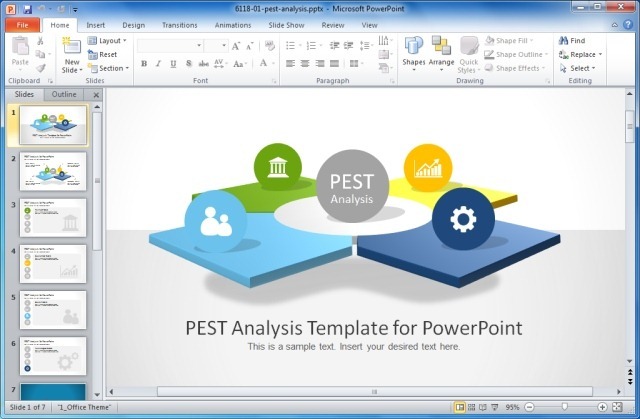 The template offers three sample slides with different diagram designs to help you create a PEST analysis for your audience at a presentation. 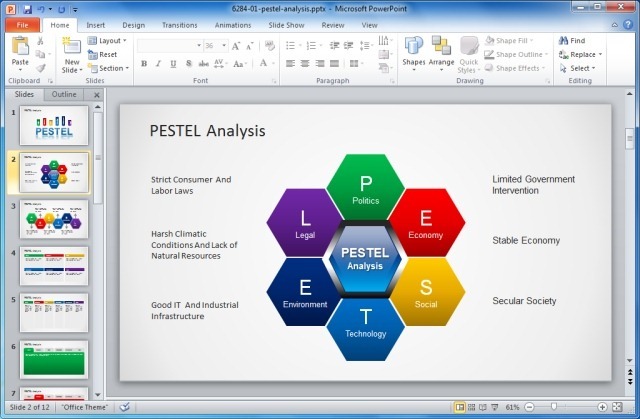 If you would like to extend your analysis to add environmental and legal aspects, then you can use the PESTEL Analysis template. 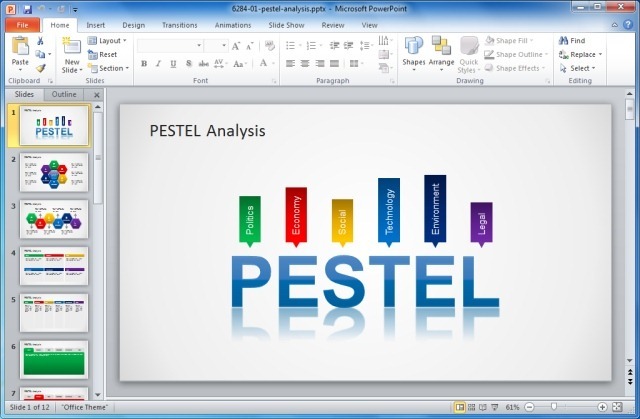 This template offers as many as 11 different sample slides with a range of layouts to help you create a PESTEL analysis. 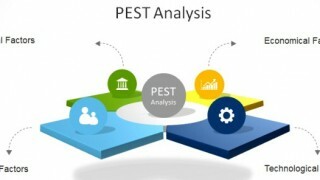 PEST or PESTEL analysis is often accompanied by other types of analysis. This is why you may find our business analysis tips and analysis templates of help, especially our posts about SWOT Analysis and Boston Matrix. Tags: Analysis Templates, Business Plan Template, Business PowerPoint Templates, Business Presentations, Diagram Templates, PEST Analysis, PESTEL, PESTEL Analysis, Strategy, Templates.